Through much hard work and experimentation over multiple years, citrus researchers have found mature trees affected by citrus greening need about 25% less irrigation than their healthy counterparts. But, what about young trees? A team of UF/IFAS scientists is on the case. 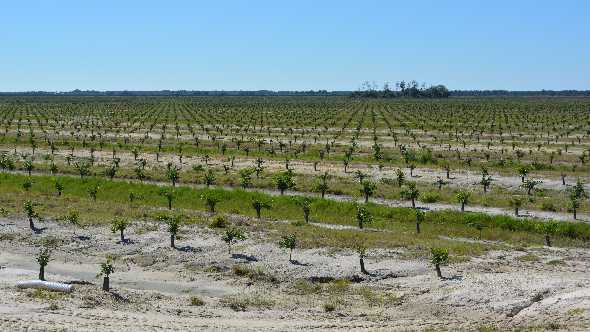 Via a preliminary greenhouse-based study funded by the UF/IFAS Citrus Research Initiative, experiments on 1-year-old orange trees (Hamlin sweet orange on Swingle citrumelo rootstock) showed similar responses to irrigation in healthy trees and those affected greening. Diseased or not, the trees grew faster when they received daily irrigation that kept pace with losses from evapotranspiration. 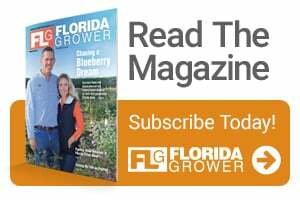 According to Davie Kadyampakeni, an Assistant Professor based at UF/IFAS’ Citrus Research and Education Center (CREC) in Lake Alfred, this result suggests that young, greening-affected trees benefit most from a full ration of water, a finding that was somewhat surprising based off past research. Detailed findings from the study is slated for publication in the near future.